Rambli, J., Wan Azlina, W. A. K. G., Mohd Salleh, M. A., and Khezri, R. (2019). "Evaluation of biochar from sago (Metroxylon spp.) as a potential solid fuel," BioRes. 14(1), 1928-1940. Recently the accessibility of sago biomass has drawn considerable interest in research regarding the production of renewable energy. In this study, sago-derived biochar was evaluated and characterized as a solid fuel. Sago biochar was produced in an electric fluidized bed reactor at temperatures between 300 °C to 600 °C, with nitrogen flow rates of 50 mL/min to 100 mL/min for 10 to 30 min of process. The optimum condition to ensure the maximum biochar yield (47%) were obtained at 400 °C, 20 min of process and of 75 mL/min of nitrogen flow. The physicochemical properties of the final product were determined through thermogravimetric analysis (TGA), scanning electron microscope (SEM), Brunauer-Emmett-Teller (BET), and elemental analysis techniques. The higher heating value (HHV) of the material was remarkably improved by almost 13% via pyrolysis. The experimental results showed that sago biomass can be considered a suitable source of solid fuel, especially in the industrial and domestic sectors in Sarawak, Malaysia. Large-scale use of fossil fuels poses a major threat to the environment and results in global warming controversies. Environmental pollution rooted in the use of traditional fuels for energy purposes is worrying. Hence, scientists in the environmental field are developing solutions for climate change such as engagement of technologies to reduce the emission of carbon dioxide as the main contributor to global warming at industrial sources. Price uncertainty and the depletion of petroleum natural resources are problematic and a vital part of concerns about future energy use (Höök and Tang 2013). Therefore, it is important to seek alternatives to fossil fuels. One of the best solutions is the use of biofuels because of the reduced emission of carbon dioxide gas to the environment (Kung and Chang 2015; Thomazini et al. 2015). At this current stage, biomass constitutes 10% to 15% of global energy (Lam and Chase 2012). Utilizing biomass waste as a fuel provides a productive means to ensure economic and environmental benefits, in addition to removing waste from the environment. Biomass can be converted into fuel via thermo-chemical processes, such as pyrolysis, carbonization, gasification, direct combustion, liquefaction, and gasification (Anderson et al. 2013; Khezri et al. 2016). Pyrolysis due to its wide range of applications, effectiveness, and its versatility compared with other processes, has received lots of attention (Xiang et al. 2016). Furthermore, pyrolysis process is involved with liquid, gaseous, and solid by-products (Hussin et al. 2015). A biochar with high calorific value can be considered a suitable fuel source (Bartocci et al. 2016; Shalini et al. 2017). Generating biochar from biomass that are composed of agricultural and forestry waste has benefits in addition to its high content of renewable energy. This includes ease of handling, storage, transportation, packaging and introduces less environmental damages related to the unremarkable sulfur content (Rambli et al. 2018). Therefore, power plants that use coal as fuel can gain several advantages if replace it with biochar (Wang et al. 2018). Biochars that are high in carbon and nitrogen enable more solutions to soil fertility problems and also assist in removal of inorganic compounds from water (Ani and Zailani 1997; Liu et al. 2013). Biochars are produced from various kinds of feedstocks. The most common feedstocks found in the literature include maize cobs, wood bark, wheat straw, rice husk, bamboo, corn, rubber bark, palm coconut shells, and micro-algae (Qian et al. 2013; Hussin et al. 2015). This study focused on the use of feedstocks in biochar production, as well as the process, kinetics, and operating parameters involved in biomass pyrolysis. The selected feedstock for this study was sago (Metroxylon Spp. ), which was from Oya district, Mukah division in Sarawak, Malaysia. An increase of RM 30 million of export earnings from sago in Sarawak was seen between 2010 to 2016 (Melling et al. 2013; Rambli et al. 2018). Because sago biomass is abundant in hydrocarbon compounds, this research evaluated its potential for utilization as a solid fuel. The raw sago was chopped, sundried for a day, ground into a fine powder form and sieved to obtain the particle size of 40 µm. Thermogravimetric analysis (TGA) (N 1000, SCINCO, Seoul, Korea) was applied for proximate analysis. Approximately 10 mg of fine biomass powder were exposed to the following conditions: a heating rate of 20 °C/min from room temperature to 800 °C and a nitrogen flow rate of 30 mL/min. Furthermore, the weight loss history was normalized and the rate was then computed. The standard methods used included (ASTM E871-82, 2013) to determine the moisture content, (ASTM D1102-84, 2013) to determine the ash content, and (ASTM E872-82, 2013) to determine the volatile matter content. The difference calculation was then applied to determine the amount of fixed carbon. The ultimate analysis was performed using a CHNS-O elemental analyzer (EA-1108, Fisons, Massachusetts, USA) following the (ASTM D-5291-16, 2016) method to determine the carbon, hydrogen, nitrogen, and sulfur contents in the biomass and biochar. The oxygen content was determined by computing the difference (the sum of those contents subtracted from 100%). A bomb calorimeter (Parr Instrument 6100, Illinois, USA) was used to identify the calorific values of the sago and optimized biochar according to (ASTM D240-17, 2017). A scanning electron microscope (SEM) (S-3400-N, HITACHI, Iowa, United States) with a potential of 1 kV to 25 kV was used to study the surface of both the sago and optimized biochar and determine their morphologies. The Brunauer, Emmett and Teller (BET) technique was used to investigate the porosity and surface area of sample biochar in order to determine the adsorption capacity and mechanical structure. BET Surface Area Analyzers (NOVA 4200e, Quantachrome Insturments, Florida, United States) was used to measure the surface area of biochar through the nitrogen gas sorption analysis at 77K. Prior to analysis, samples were vacuum degassed at 300 °C for 4 to 16 h (conditions typical for carbons). Particle density was measured by helium pycnometer (Pentapycnometer, Quantachrome Instruments) using degassed samples from BET analysis and long purge times (10 minutes) to prevent errors due to volatile content outgassing. The objective of this evaluation is to determine the effect of the process parameters on the production of sago-based biochar through pyrolysis and by using a one-factor-at-a-time (OFAT) method. Using an electric heating fluidized bed reactor, 20 g of biomass sample underwent pyrolysis at different temperatures between 300°C to 600 °C for the retention times of 10 min to 30 min, constant heating rate of 50 ºC/min and with different nitrogen flow rates of 50 mL/min to 100 mL/min. The experiments were accomplished in total 13 runs. A schematic diagram of the pyrolysis equipment is shown in Fig. 1. The entire pyrolysis facilities consisted of an electric heating fluidized bed reactor, condenser unit, gas clean-up units, and gas sampling unit. The reactor was constructed from heat-resistant 316 stainless steel with internal diameter of 54 mm and height of 370 mm. Two individually controlled electric furnaces covered the reactor and were used to increase the temperature and prevent heat loss to the atmosphere during operation. To avoid excessive heat loss to the atmosphere and maintain the reactor temperature, a thick layer of grass wool fully covered the top and bottom of the reactor. Two thermocouples (K-type, Jiangsu Plaza, Jiangsu, China) were installed in the middle (pyrolysis zone) and top (freeboard) of the reactor to monitor the temperature during experimental operation. Before beginning the experiment, air was supplied by an external compressor and was introduced to the reactor from the base of the bed through a nozzle to remove any trapped gas from the reactor. Nitrogen was used as the pyrolysis agent and its flow rate varied from 50 mL/min to 100 mL/min. The experimental temperature varied from 300 °C to 600 °C and the retention time varied from 10 min to 30 min. For each experiment, the produced gas was cooled down through a condenser and cleaned via filtration. It was then collected in a 10 litre gas sampling bag (one sample) during operation, which was later sent for gas chromatography (GC) analysis. When the operation was completed, the equipment was left to cool down for approximately 60 min, and the bio-oil and sago biochar products were collected separately and sent for analysis. 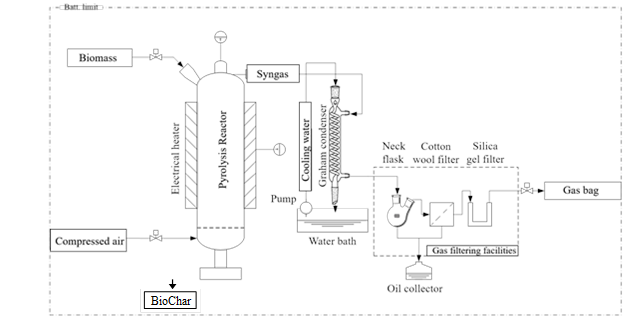 The sago-based biochar was characterized, and the results were compared with the raw biomass to study the effect of pyrolysis on the chemical properties of the material. A suitable fuel that has high burning tendencies and energy density is marked by low moisture and ash contents, in addition to having high fixed carbon values (Cha et al. 2016). The regarded features can be identified through proximate analysis. The thermal degradation characteristics of sago biomass and sago biochar are presented in Fig. 2a and 2b. with the help of thermogravimetry (TG) and differential thermogravimetry curves (DTG). Fig. 2. Residual mass ratio and DTG of a) sago biomass and b) sago biochar on dry basis. Condition: nitrogen atmosphere (30 mL/min), heating rate (10 K/min). Both materials showed a small DTG peaks around 76.8 °C (350 K), which are indicative to the moisture content, followed by big peaks around 326.8 °C (600 K), which are indicative to the decomposition of cellulose and hemicellulose. Beyond 426.8 °C (700 K) in sago biomass and 526.8 °C (800 K) for biochar DTG curves indicate the decomposition of lignin (Mohammed et al. 2011). However, according to the TG curve in Fig. 2 the degradation of biochar contents including the moisture, volatiles, fixed carbon and ash as response to gradual heating seems less intensive in values comparing to the sago biomass. The results from characterization of sago biomass and biochar in this study are presented in Table 1. The results of proximate analysis are presented on dry basis criteria, whereas the ultimate analysis results (CHO) are presented in dry and ash free basis (dafb) measures accordingly. It should also be noted that the amount of nitrogen content in biomass are disregarded from the report for its considerably lower contents than other elements hence the presence of it may overestimate the oxygen content to a very small extent. According to the results, the relatively high fixed carbon and HHV as well as low volatile matter and ash content of sago biomass indicates a suitable biomass to be used as a solid fuel. For better understanding, the properties of sago biomass and biochar have been followed by the properties of other common biomass obtained from previous studies such as palm oil-based biomass, waste pomegranate peel, rice husk, wood bark, cocopeat, and palm kernel shell (Hassan et al. 2013; Lee et al. 2013a; Mopoung and Udeye 2017; Sohni et al. 2018). According to the results, the properties of sago-based materials in terms of fixed carbon, volatile matter and ash content are fairly comparable to other common biomass, which are considerably favorable nowadays to use in different industrial applications. A significant decrease was observed in the amount of volatile substances from 74.6% to 61.5% when the sago biomass turned into biochar because of the effect of biomass thermal degradation (Qian et al. 2015). The volatile matter related to other types of biomass in Table 1 ranged from 16.1% to 80.1%. It was observed that the fixed carbon of sago biomass has the lowest content of 7.9%, while waste palm oil mill sludge has relatively higher content of 30.5% among others. An increase in the fixed carbon content from 7.9% to 10.4% and reduce of moisture content on the surface of the sago were seen as the result of slow pyrolysis of sago biomass into biochar. The ash content of the sago biomass, however, was increased to 24.2% due to the removal of organic substances from the biomass. The high ash content in the biochar could be explained by the unwashed sago biomass that has been used in the pyrolysis. The ash content of biochar can be reduced through a variety of techniques such as water washing and briquetting to reduce the presence of fly ash while use in direct combustion (Liu et al. 2015; Qi et al. 2017). The initial hydrogen and oxygen contents in the sago biomass were found to be 6.7% and 55.7%, respectively. However, these values decreased immensely to 5.1% and 41.1%, respectively, as the biomass converted into biochar. The same results were reported in earlier biomass pyrolysis studies for different types of feedstock (Hawkins et al. 2007; Colantoni et al. 2016). The higher heating value (HHV) is defined as the release of energy for a unit of an entirely burnt fuel. The HHV is the main feature used to evaluate any fuel meant to be used as an energy source (Qin et al. 2011). Therefore it was used to indicate the suitability of bio-based fuels in this study. According to (Shalini et al. 2017), the HHV of biomass increases in response to the reduction of oxygen and hydrogen contents as the result of pyrolysis. The HHV value of sago biomass was found to be 22.16 MJ/kg while the value of 25.4 MJ/kg was observed for the biochar. Scanning electron microscopy was used to determine the images of the sago biomass (Fig. 3a) and biochar (Fig. 3b) cells at a magnification of 300x. A further coarse irregular shape of biochar particles was observed as compared to the biomass. This can consequently create some issues with the mechanical properties and handling of biochar (Kumar and Singh 2014). To overcome such issues, the biochar density needs to be improved via briquetting and pelleting (Qian et al. 2015; Qi et al. 2017; Bartocci et al. 2018). In contrast, the high porosity of the biochar has some beneficial features in some applications, such as its use as absorber and supercapacitor. The briquette strength related to the capillary binding of porous particles, as well as the rough mechanical connection of the surface particles are subject to the porosity of the structures. Moreover, in Fig. 3a, sago biomass was found to have longitudinal pores that were approximately 100 µm in diameter. These larger pores were from the raw biomass vascular structure. However, the pores volume were increased on the surface of biochar (Fig. 3b), which can be due to degradation of organic materials (lignin, hemicellulose and cellulose) and formation of bundles or channel structures during pyrolysis (Zhao et al. 2017). The textural properties of the sago biochar were determined by BET analysis at two different pyrolysis temperatures of 350 °C and 400 °C, and the results are presented in Table 2. The specific surface area of the biochar at 400 °C and 350 °C were found to be 2.73 m2/g and 1.89 m2/g, respectively. According to the results, biochar sample prepared at 400 °C pyrolysis temperature possessed higher total pore volume (0.118 cm3/g) than the one obtained at 350 °C (0.0921 cm3/g). The surface and pore area of biochar as solid fuel are significant since the shape and interconnections between pores significantly influence the physical properties of a material, such as its density, mechanical strength, and thermal conductivity (Smolínski and Howaniec 2017). Moreover, biochar having high carbon content and surface area will have a high potential to be turned into activated carbon for certain applications such as filtration of gas and water, treatment of water and sewage, and separation of gas and solid (Spokas et al. 2009; Park et al. 2014; Inal et al. 2015). The effects of the temperature, nitrogen flow rate, and retention time on the yield of sago biochar are shown in Fig. 4a, 4b, and 4c, respectively. For the first set of evaluation, the temperature varied over the range of 300 °C to 600 °C, while the nitrogen flow rate and retention time remained constant at 75 mL/min and 20 min, respectively. According to Fig. 4a, a temperature of 400 °C yielded the highest amount of biochar (47%), and thus this was considered the optimum temperature. Increasing the temperature from 300 °C to 400 °C caused the biochar yield to increase slightly because of the removal of moisture and volatile compounds from the solid biomass. However, the yield started to decrease with temperatures above 400 °C, and it reached a minimum of 31% at 600 °C. The decrease in the yield with higher temperatures was explained by the carbon cracking rate increasing with the temperature. The released moisture from the biomass in the presence of sufficient heat reacted with the heavy carbon content of the solid material and led to the destruction of the carbon structure and conversion into smaller hydrocarbons, which was later captured as bio-liquid or via condensation of the syngas. Generally, increasing the nitrogen flow rate results in an increase in the yield of non-condensable gas; therefore, the biochar yield decreases because of the rapid removal of pyrolysis vapour from the reaction zone (Mohammed et al. 2015). An increase in the nitrogen flow rate from 50 mL/min to 75 mL/min resulted in a slight increase in the biochar yield. An excess of nitrogen led to more oxygen in the pyrolysis zone, which increased the energy conversion. However, an increase in the nitrogen flow rate above 75 mL/min caused the hot pyrolysis volatiles to remove from the reactor, which cooled down the reactor and decreased the pyrolysis performance. Similar results were reported in previous experimental studies that used high nitrogen flow rates in pyrolysis of different biomass, which all contributed to the lower biochar yields (Mohammed et al. 2015, 2016). For the reason stated, the biochar yield decreased to a minimum of 27% at a nitrogen flow rate of 100 mL/min (Fig. 4b). According to Fig. 4c, as pyrolysis retention time increased, it resulted in an increase in the biochar yield until it reached a maximum of 47% in 20 min. Any retention time longer than 20 min was associated with a decrease in the biochar yield as a result of the slow conversion of biomass carbon into smaller hydrocarbons during pyrolysis. Disintegration of compounds in the pyrolysis process at high temperatures may have been the main cause of the decrease in the product yield in longer process times (Mašek et al. 2013; Xie et al. 2015; Rambli et al. 2018). The chemical structure and yield of the biofuels that were produced from the biomass was highly impacted by the retention time. In general, all of the factors (temperature, nitrogen flow rate, and retention time) had relatively high influences on the product yield. The optimum condition obtained from the OFAT evaluation in this study are reported in Table 3 and were compared with those for other biomass sources found in the literature. The maximum biochar yield from sago (47%) was produced at 400 C, 20 min, and a nitrogen flow rate of 75 mL/min. The optimized biochar values of the different biomass samples ranged from 32.2% to 54.9% (Chin and Siddiqui 2000; Lee et al. 2013b; Iberahim et al. 2018; Sohni et al. 2018). This study evaluated the potential of SDB as a solid fuel. The conversion of biomass to biochar was performed by pyrolysis in an electric fluidized bed reactor with a total feeding of 20 g of biomass. Nitrogen was used as the pyrolysis agent. A sensitivity analysis was performed using a OFAT method to study the effect of the temperature (300 °C to 600 °C), nitrogen flow rate (50 mL/min to 100 mL/min), and retention time (10 min to 30 min) on the biochar yield. Characterization analysis (ultimate and proximate analysis, calorific value determination, SEM and BET) was implemented on both the biomass and biochar samples, and their properties were compared to assess the quality of the final product as a suitable energy source. According to the results, pyrolysis of sago biomass resulted in an increase in the HHV and carbon content and a decrease in volatile substances and oxygen contents as converted into biochar. Furthermore, the thermal conversion caused an increase in the number, volume, and area of surface pores according to the results of SEM and BET analysis. The temperature was shown to have the highest impact on the biochar yield. The maximum yield of 47% was obtained at 400 °C, 75 mL/min, and 20 min of temperature, nitrogen flow and process time respectively. This study showed that the value of sago biomass as a sustainable and environmental friendly solid fuel can be considerably increased when undergoes pyrolysis and converted into biochar. The authors would like to acknowledge and thank the Chemical Engineering Department, Chemical and Environment Engineering/Sustainable Process Engineering Research Centre, University Putra Malaysia for allowing the use of their laboratories for the tests. The authors would also like to thank the Sarawak Chief Minister Office for the financial assistance; all personnel, colleagues, and research assistants who immensely contributed to this paper; and the Engineering and Physical Sciences Research Council for partially adding to the funding of the whole research through the BEFEW project (Grant No. EP/P018165/1). Ani, F. N., and Zailani, R. (1997). “Characteristics of pyrolysis oil and char from oil palm shells,” in: Developments in Thermochemical Biomass Conversion, A. V. Bridgwater and D. G. B. Boocock (eds. ), Springer Dordrecht, Dordrecht, Netherlands, pp. 425–432. ASTM D1102-84 (2013). “Standard test method for ash in wood,” ASTM International, West Conshohocken, PA, 2013, www.astm.org. ASTM D240-17 (2017). “Standard test method for heat of combustion of liquid hydrocarbon fuels by bomb calorimeter,” ASTM International, West Conshohocken, PA. www.astm.org. ASTM E871-82 (2013). “Standard test method for moisture analysis of particulate wood fuels,” Technical report, ASTM. www.astm.org. ASTM E872-82. (2013). “Standard test method for volatile matter in the analysis of particulate wood fuels,” Technical report, ASTM. www.astm.org. Hassan, S., Kee, L. S., and Al-Kayiem, H. H. (2013). “Experimental study of palm oil mill effluent and oil palm frond waste mixture as an alternative biomass fuel,” Journal of Engineering Science and Technology 8(6), 703-712. Hawkins, R., Nilsson, J., Oglesby, R., and Day, D. (2007). “Utilization of biomass pyrolysis for energy production, soil fertility and carbon sequestration,” in: UN Commission on Sustainable Development Partnerships Fair – Partnership in New Technologies for Small Island Developing States. Khezri, R., Azlinaa, W., and Tana, H. B. (2016). “An experimental investigation of syngas composition from small-scale biomass gasification,” International Journal of Biomass & Renewables 5(1), 6-13. 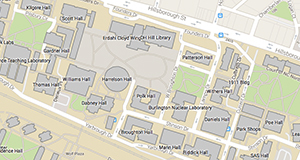 Lee, Y., Park, J., Gang, K. S., Ryu, C., Yang, W., Jung, J.-H., and Hyun, S. (2013a). “Production and characterization of biochar from various biomass materials by slow pyrolysis,” Food and Fertilizer Technology Center, 1-11. Melling, L., Tan, C., Goh, K., and Hatano, R. (2013). “Soil microbial and root respirations from three ecosystems in tropical peatland of Sarawak, Malaysia,” J. Oil Palm Res. 25(1), 44-57. Mohammed, M. A. A., Salmiaton, A., Azlina, W. W., Amran, M. S. M., and Fakhru’l-Razi, A. (2011). “Air gasification of empty fruit bunch for hydrogen-rich gas production in a fluidized-bed reactor,” Energy Conversion and Management 52(2), 1555-1561. Qi, J., Li, Q., Wu, J., Jiang, J., Miao, Z., and Li, D. (2017). “Biocoal briquettes combusted in a household cooking stove: Improved thermal efficiencies and reduced pollutant emissions,” Environmental Science & Technology 51(3), 1886-1892. Qin, L., Li, Q., Meng, A., and Zhang, Y. (2011). “Pyrolysis properties of potential biomass fuels in Southwestern China,” in: ISCC 2011: Cleaner Combustion and Sustainable World, Corfu, Greece, pp. 457-464. Rambli, J., Ghani, W. A. W. A. K., and Salleh, M. A. M. (2018). “Characterization of sago-derived biochar as potential feedstock for solid fuel,” Journal of Energy and Safety Technology1(2), 11-17. Shenbagavalli, S., and Mahimairaja, S. (2012). “Production and characterization of biochar from different biological wastes,” International Journal of Plant, Animal and Environmental Sciences 2(1), 197-201. Article submitted: November 18, 2018; Peer review completed: January 4, 2019; Revised version received and accepted: January 15, 2019; Published: January 23, 2019.